Finding out I was pregnant was a whirlwind of emotions. At first, I was scared. I hadn’t planned this. I’d just started a new job and the baby’s father lived abroad, offering little support. I was still living at home with a parent who’d just recovered from breast cancer. The thought of bringing another little person into our lives terrified me and I had no idea if I had what it took to be a mother. However, what I did have was an incredible support network from my own mother, Caron, who promised to stand by me no matter what I decided to do. It didn’t take me long to realize there was no other choice for me; I was going to continue this pregnancy. I was going to be a mummy and once I accepted that, I couldn’t be more excited. The initial fear had passed and replacing it was nothing but unconditional love for this tiny little bump that had blessed my life. Seeing their heartbeat for the first time was overwhelming. There it was, fluttering away on the small screen. 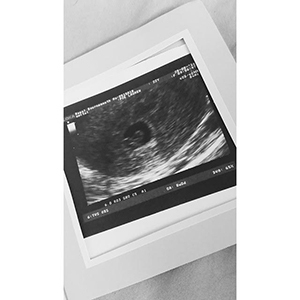 I saw that little peanut on the monitor and I fell in love. I started thinking about what I would call them, where we would live. I planned our entire future together. And then, one week later, it was gone. I knew there was something wrong the moment I started to bleed. Doctors tried to tell me it was fine. ‘It’s just spotting’, one reassured me, but then the pain kicked in. The horrible, unsettling stomach cramps. ‘It’s just your body changing,’ another doctor told me, dismissing my fears. Except it didn’t get better. It got worse. In the end, I telephoned the out of hours doctor, crying in pain and hoping someone could give me answers. Instead, all I was told was; ‘if it’s happening, there is nothing we can do.’ Nothing. They wouldn’t even see me for a scan. In a vain attempt to reassure myself, I took another pregnancy test and when the result came back positive, I relaxed. Everything was fine. I was still pregnant. I found out I’d suffered a miscarriage just one hour after my first midwife appointment. It was heartbreaking. One minute, I’d been talking to my mum about baby names and how I was going to tell work. The next, everything disappeared. After speaking to the midwife about my concerns, she encouraged me to phone the Early Pregnancy Unit myself and when I did, they booked me in straight away. Sitting in the waiting room was awful. I remember clinging to my stomach, a part of me hoping if I just held on tight enough, I’d be able to stop whatever was happening. I begged and I prayed that my little one would be okay. Sadly, they weren’t. It became obvious something was wrong the moment I stepped into the room. It was so different from the first scan. Silent, and eerie. And when the nurse didn’t offer to turn the other screen on for me to see, I knew what she was about to tell me. ‘I’m very sorry, Lauren, but the heartbeat we found last week has gone,’ she told me, confirming my worst fears. In that one moment, I felt my own heart shatter into a million pieces. Everything I had planned; the names, the nursery, our future, vanished in a matter of seconds. Ripped out from underneath me, almost as if it had never even been there. I told the father first. ‘It doesn’t matter, it wasn’t even a baby yet,’ he told me. And then my mother untold the few friends and family members we had shared the good news with. ‘Well, at least it was early,’ some said or ‘you’ll have another someday’. It was exhausting. I felt as though they were belittling my loss, as though my grief was being discounted. Of course, most of them meant no harm. People just don’t know what to say in these kind of situations, but I needed to grieve. I needed people to acknowledge that grief. I disappeared into a dark place. I felt lost and alone. I felt that it must have been something I did wrong; that it was my fault. Maybe I hadn’t wanted the baby enough. Maybe I didn’t love it enough. I should’ve been more careful with what I ate or I shouldn’t have had that glass of wine a few weeks ago, the one I’d poured before I’d even found out the news. When a person announces they’re expecting, the world gushes around you. It congratulates you. Strangers touch your belly, they ask you if you’ve thought of names or found out the gender. When a person denounces a pregnancy, it’s the opposite. People avoid. I ended up hiding my pain. I suffered alone because the few I’d tried to talk to seemed to think that I should move on. I gained weight, which didn’t help lift my mood or outlook. I was sad at home. I was even sadder at work. I would excuse myself to go to the bathroom and cry on a daily basis. I was signed off with depression and I stopped getting out of bed in the mornings. I couldn’t let it go; I couldn’t move on. It was the darkest period of my life. Since then, I’ve spoken to a lot of women who have lost babies. Friends stepped forward and shared their own stories with me. Strangers from support groups got in touch to talk about their own pain. I’ve realized that what happened was not my fault. I deal with my grief instead of diminishing it and I refuse to let others diminish it, as well. I don’t believe miscarriage or losing babies is talked about enough. It’s become a taboo. Many women I’ve spoken to have confessed they feel too ashamed to bring it up, or too concerned that it might make other people feel uncomfortable. We’ve avoided social situations out of fear that we will see someone pregnant, or that someone will ask us if we have children, knowing that we will smile and lie because it’s easier than admitting that yes, we are mothers, but we are bereaved. We keep these experiences close to our hearts, but we do not share our pain. Are we hiding it because it didn’t matter? No. It is because we are afraid, but we shouldn’t be. Our grief is still grief and it matters. I have never missed someone as much as I missed my angel. My heart hurts. Not a sharp, tugging pain. But a dull, throbbing ache that never seems to cease, not even with time. However, I’ve found that by sharing my story and opening up about my pain, I’ve found peace. I make sure that no matter what, my baby is not forgotten. They were here, and they were loved. I hope that by sharing my story, it encourages others to do the same. Each year, I will light a candle to honour their memory. I will release a balloon to celebrate what should have been their due date. I will continue to tell others about them and I will make sure people knew how precious it was to have them, even if I wasn’t allowed to keep them. Every baby matters and while some of us cannot hold them in our arms, we will forever hold them in our hearts. Thank you for sharing your story. It inspires me to write mine. Never in a million years did I think we would suffer 2 miscarriages in 7 months. I woke up with spotting on my birthday and I knew something was wrong.